Imagine living in a comfortable, modern house with no cold drafts, no temperature variations from room to room and, astoundingly, virtually no heating or cooling bills. It might sound too good to be true, but these pleasant conditions are the norm for people who live in a Passive House. These are the basic tenants of the Passive House approach. 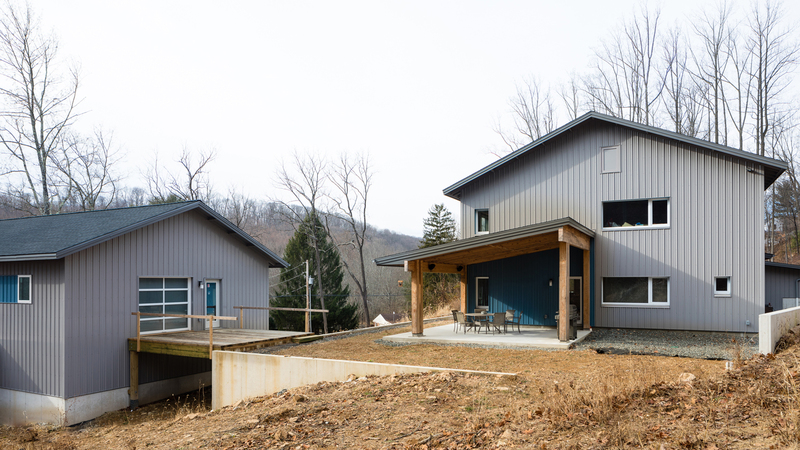 A Passive House project maximizes the energy efficiency of the basic components inherent in all buildings: the roof, walls, windows, floors and utility systems. By minimizing a building’s energy losses with smart insulation, the heating and cooling system is not called on nearly as frequently, saving resources and operating costs, while reducing the homes impact on the environment. 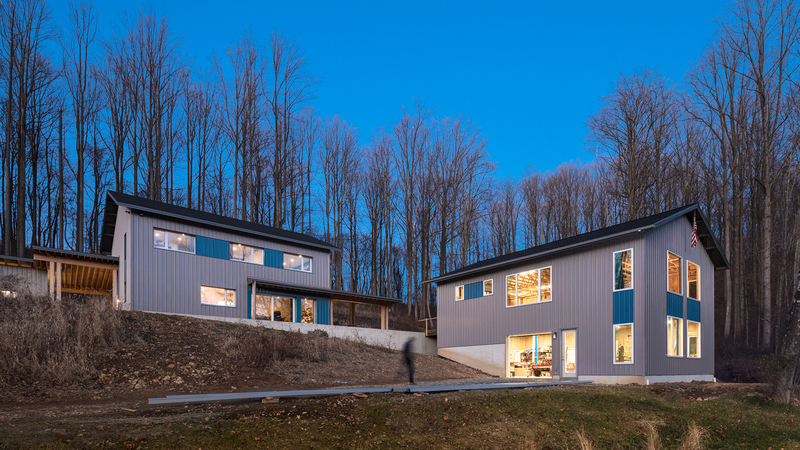 Unlike any other structures, Passive House buildings maintain occupant comfort for more hours of the year without relying on active heating and air-conditioning equipment. With a history of inexpensive fuel and undisciplined construction techniques, there has been little need to consider the impact of energy losses through poorly engineered building enclosures. Typical construction is plagued with low levels of insulation, high air infiltration, and thermal bridging between interior and exterior. Today’s enlightened homeowner is seeking a new approach for better living. 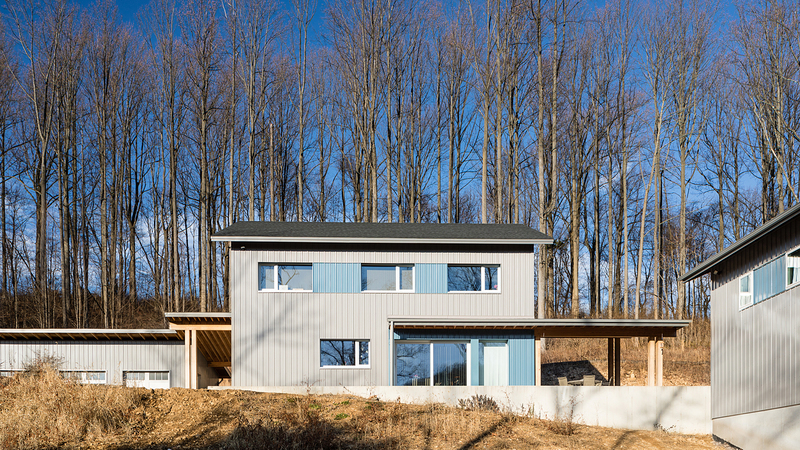 The Soeder Residence is central Pennsylvania’s first house designed to meet the rigorous Passive House standard. The sloping site is in an open field with pastoral views to the south. The owners wanted a home for retirement and pursuing lifelong projects and hobbies. 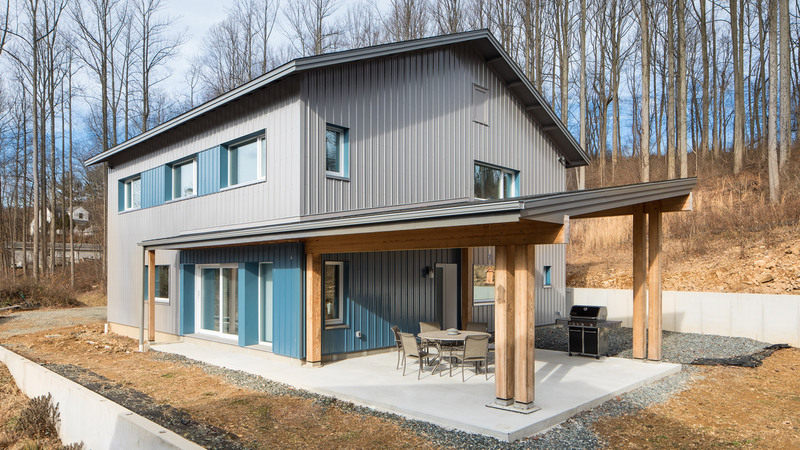 The Soeder Passive House, built by owner Shawn Soeder, uses the same wall assembly and building morphology as our Scranton Passive House and Keffer Passive House projects. There are many benefits of building to the Passive House standard and together they add up to a simply beautiful way of living. 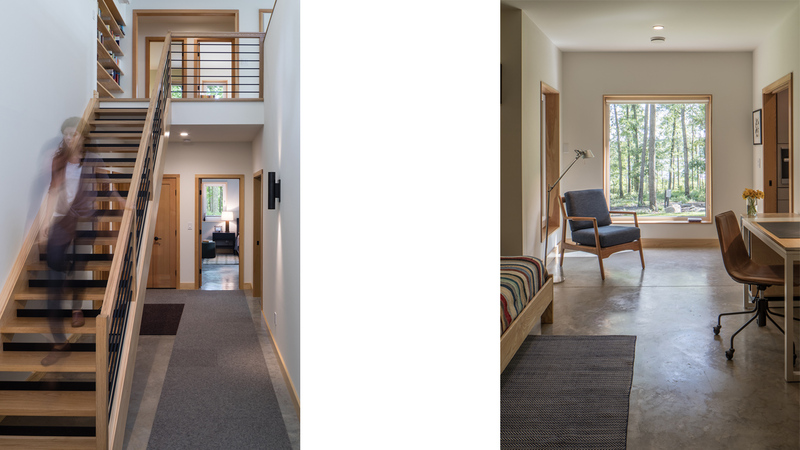 Passive House offers the highest level of interior comfort of any building type today with comfortable temperatures, no drafts or cold spots, and no temperature swings. We spend 90% of our time indoors where the air quality is typically 3 to 4 times worse than it is outside. In a Passive House, a continuous supply of filtered fresh air is provided by the ventilation unit which also transfers the thermal energy from the air leaving the house to the fresh air coming into the house, greatly reducing the need for heating and cooling. The result is comfortable, fresh indoor air with greatly reduced dust, pollen, and other pollutants. Passive House buildings consistently reduce energy for heating and cooling by 80 to 90% over typical construction. There is simply no need for a large, conventional, expensive, resource guzzling heating and cooling system. Extraordinary airtightness levels, triple-pane glass, and thick insulation also provide superior sound insulation. Passive Houses are very quiet. Careful detailing, advanced design, better building components, and proven building science help to ensure there is no mold and no condensation inside the home or inside the walls of the home. Passive House buildings are designed to last a long time. 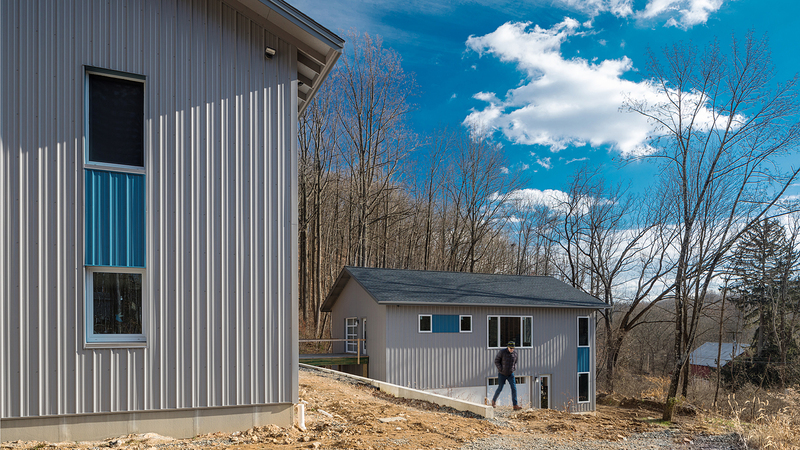 With simple mechanical systems and high quality care-free building components, Passive House buildings are simple to operate and inexpensive to maintain. Because a Passive House very seldom requires active systems for heating and cooling, comfortable indoor conditions are maintained even during power outages or in the face of fuel shortages. The initial cost of a Passive House building is approximately 0% to 10% more than typical construction. However, the high quality construction reduces monthly heating and cooling costs by 80% to 90%. 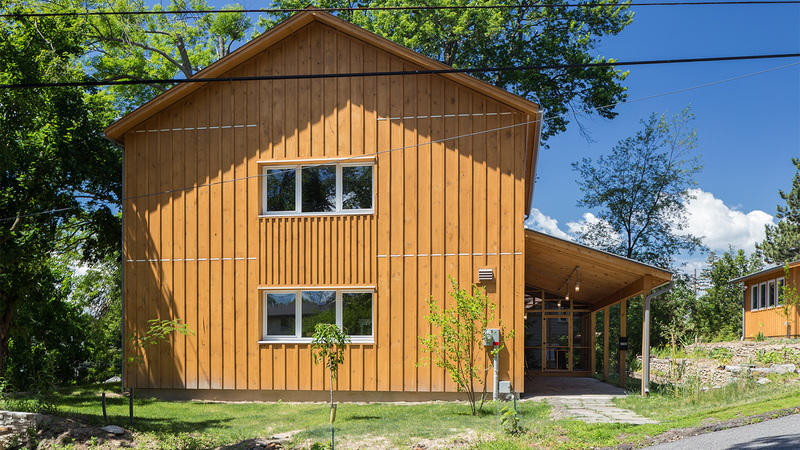 The low energy required by a Passive House for heating and cooling means that a small and affordable renewable energy system can turn a Passive House into a Net Zero (glossary link) energy building. Computer energy modeling of a home’s energy consumption during the design stage and third party verification during the construction stage provide assurance of a superior building. Passive House design employs detailed annual weather data to model a building’s energy performance. The building form emerges from minimizing losses through the exterior enclosure resulting in efficient geometry. The windows sizes and orientation are optimized for energy balance during the entire year. 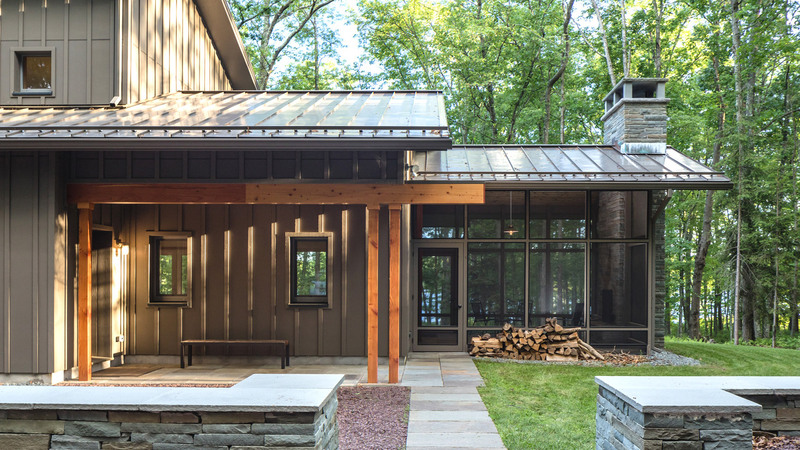 Additionally, the well balanced passive solar design adds excellent daylighting throughout the interior. Passive House buildings are super insulated. With walls two to three times as thick as today’s standard construction, the inside temperature is stable and predictable without the need for heating or cooling adjustments. Wall assemblies are analyzed and detailed to allow for proper moisture management that results in a long lasting and exceptionally healthy building. Historically, windows and doors are weak links in a building’s thermal defense system. We can all relate to the drafts they can create in an average home. 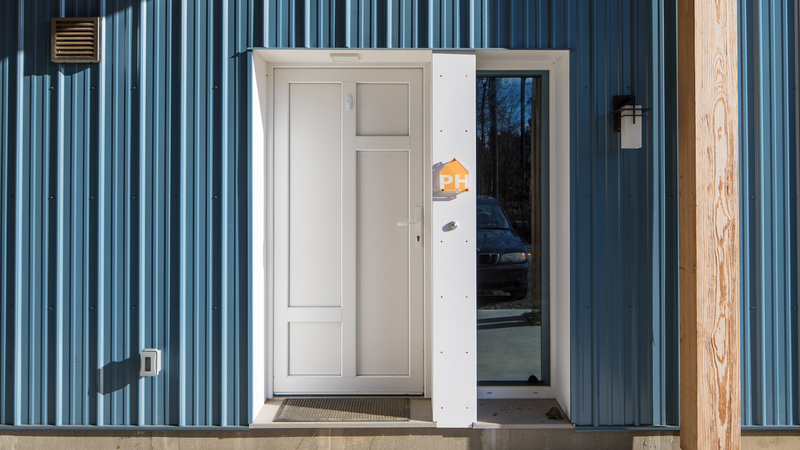 Passive House design places significant emphasis on specifying high performance windows and exterior doors. To meet the high performance needs of various climate zones, windows must meet strict standards regarding: insulation, air tightness, and solar heat gain values. Well detailed window design and flawlessly executed window installation are critical to the performance of Passive House buildings. Passive House takes great care in designing, constructing and testing the building enclosure for industry leading leakage control. Blower door testing is a mandatory technique in assuring high building performance through a virtually leak free enclosure. Walls are carefully designed to be virtually air tight, while allowing water vapor to escape maintaining a comfortable and healthy environment. If you combine all the small leaks in a typical home, it would be equivalent to cutting a hole in the exterior wall the size of a garbage can lid A Passive House has total air leakage about the size of a baseball or smaller. 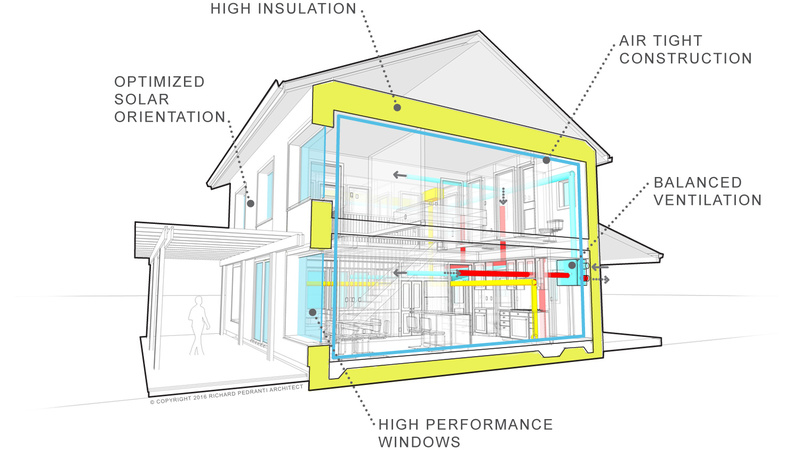 The “lungs” of a Passive House is a box called a “heat recovery ventilator” (HRV). It provides a constant supply of filtered fresh air and saves money by recycling the energy that already exists in the home’s indoor air. In the HRV, the heat from outgoing stale air is transferred to the incoming fresh air, while it is being filtered. It provides continuous comfort and a huge upgrade in indoor air quality that is particularly important for people sensitive to material off-gassing, allergies and other air-borne irritants. 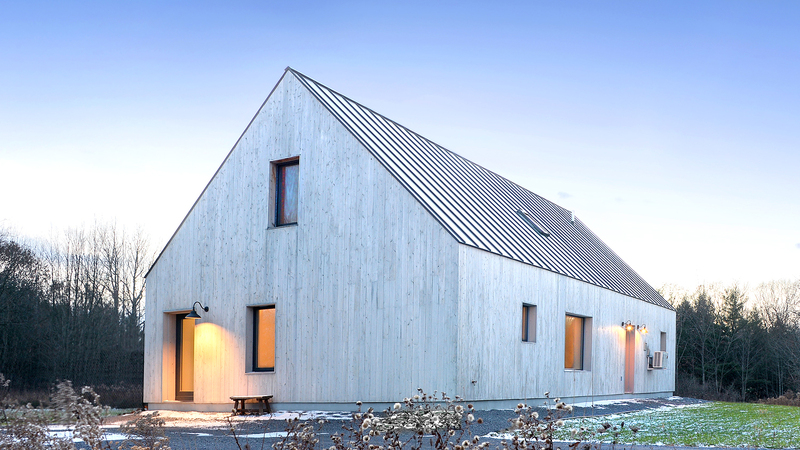 Using these basic principles, Passive House buildings have been very successful worldwide with somewhere between 30,000 and 50,000 buildings built to the Passive House standard in Europe. North America is just catching on with approximately 300 new buildings built to the Passive House standard. Passive House offers proven sustainability, unmatched comfort, and excellent indoor air quality all with very low energy consumption. 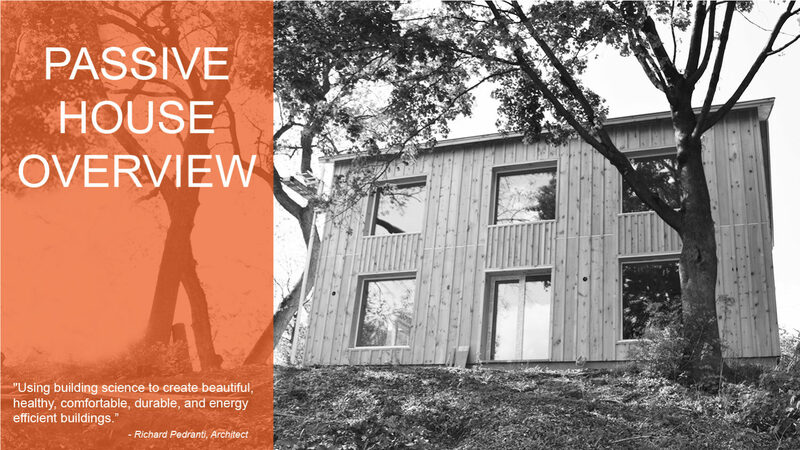 The Passive House approach is the future of the US building industry. Does a Passive House cost more? The reality is counterintuitive: If you include operating costs in the equation, Passive House quickly emerges as the most affordable way to construct any building. Here’s the math: Passive House walls and windows cost more than building code prescribed construction, while Passive House heating systems cost less. On balance, Passive House construction costs up to 10% more than code construction. Costs for land and carrying costs remain unchanged. Upon completion, Passive House buildings require an average of 90% less heating energy than code buildings. 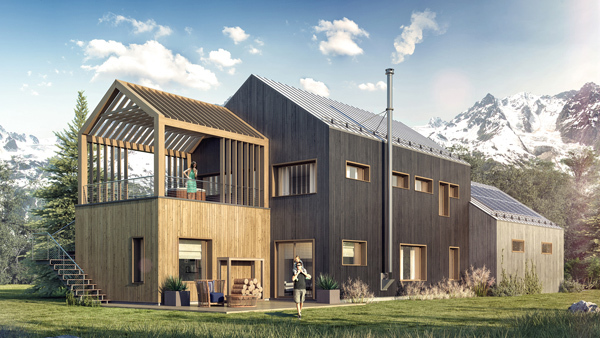 Amortize the one-time construction premium over the life of a mortgage, subtract the annual savings on utility bills, and most Passive House owners save money every single year. This inherent affordability is no accident. 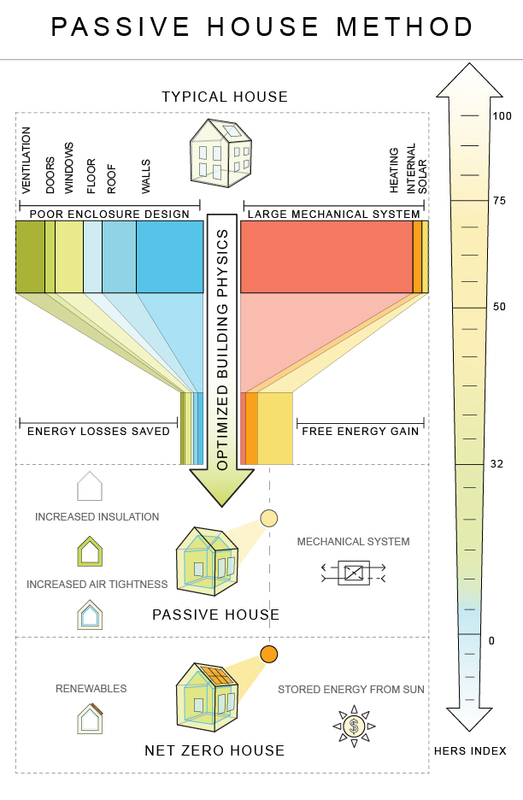 The Passive House standard evolved from research experiments in which European scientists sought to calculate a balance point below which the installation of more insulation provided a measurable return on investment, and above which more insulation returned no economic benefit. This economic “sweet spot” is what defines the Passive House standard, as well was what distinguishes Passive House from most green building approaches. The savings begin in year one, and grow as energy prices rise. That’s one of the reasons that organizations such as Habitat for Humanity are following the Passive House standard. What is a Zero Energy Building (ZEB)? Is a Passive House a Zero Energy Building? 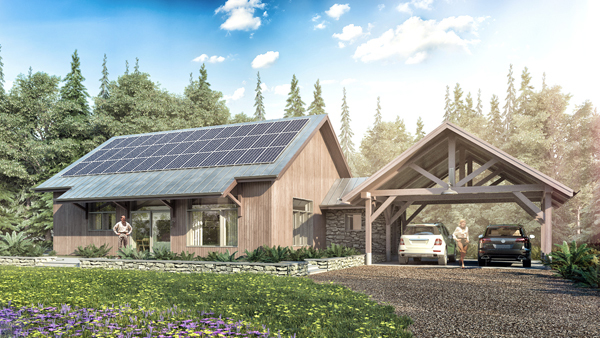 A Passive House is designed to be a Net Zero Energy home with the installation of a small and affordable renewable energy system such as solar panels. Passive house is the best path to Net Zero Energy home because it uses “passive measures” which reduce energy consumption for heating and cooling between 80 to 90 percent. 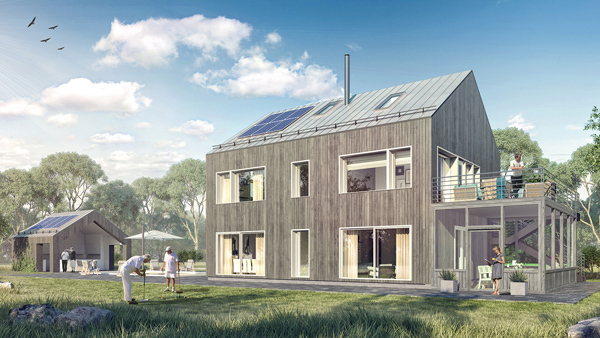 What is like to live in a Passive House? 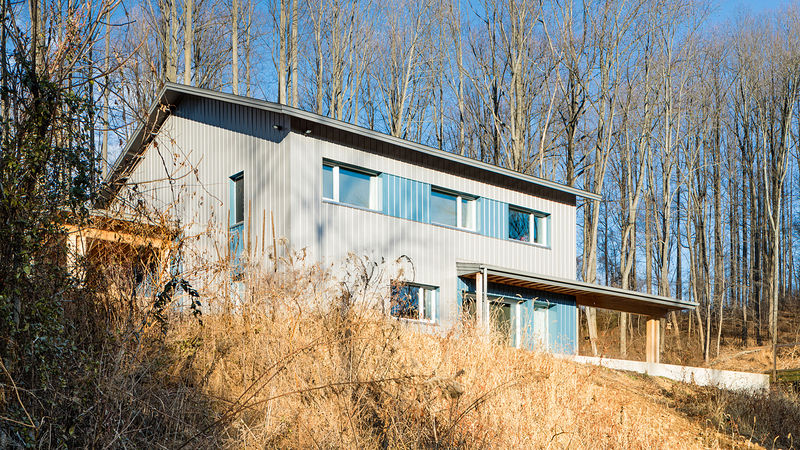 Is Passive House a passive solar home? A Passive House is not the same as a “passive solar home” made known and became popular in the 1970’s. Passive solar homes rely on extensive use of south facing glass and thermal mass to store thermal energy. 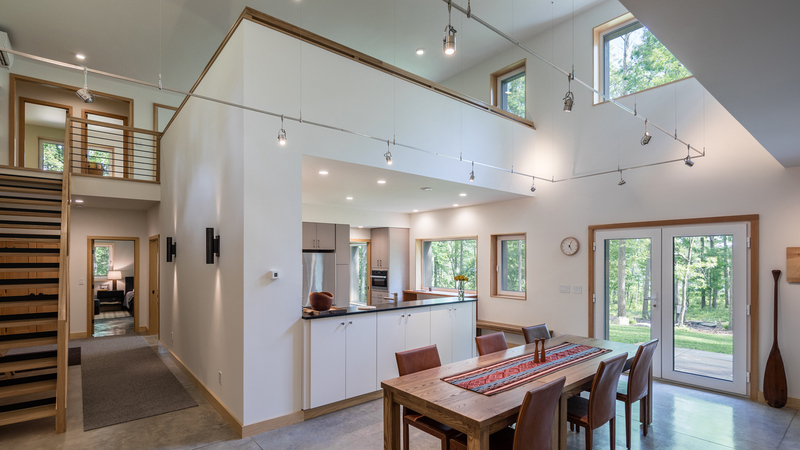 Passive House uses the concepts of superinsulation and air tight construction along with passive solar strategies to create a comfortable, healthy, and energy efficient indoor environment. A Passive House relies much less on storing solar energy and focuses on decreases energy losses through a much improved building enclosure. 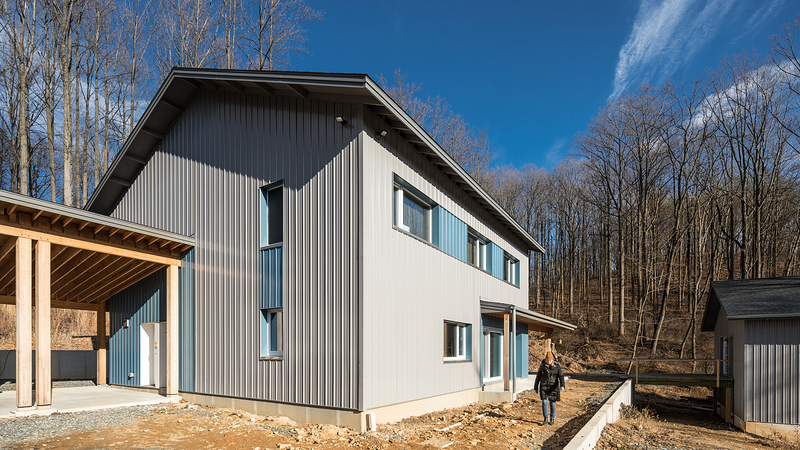 It’s common building wisdom that a house needs to “breathe.” Can the passive houses air-tight construction lead to moisture or air quality problems? New homes today are being built “tightly” in an improper fashion, that traps moisture inside and leads to significant mold and indoor air quality problems. Conversely, Passive House employs an appropriate vapor barrier and a mechanical, balanced ventilation system with heat recovery, which assures superior air-quality and comfort by continually exchanging the indoor air. Moisture is safely removed, as well as other potentially unhealthy pollutants (for example off-gassing from carpets or furniture). Also, people with allergies can easily control the indoor air-quality by specifying filters according to their particular medical needs. Can I have a fireplace or woodstove in my Passive House? Yes, but it is unnecessary because there is no need for the amount of heat that a typical fireplace or woodstove provides. A Passive House requires a very small amount of heat to keep a comfortable temperature so a wood stove would not be used. 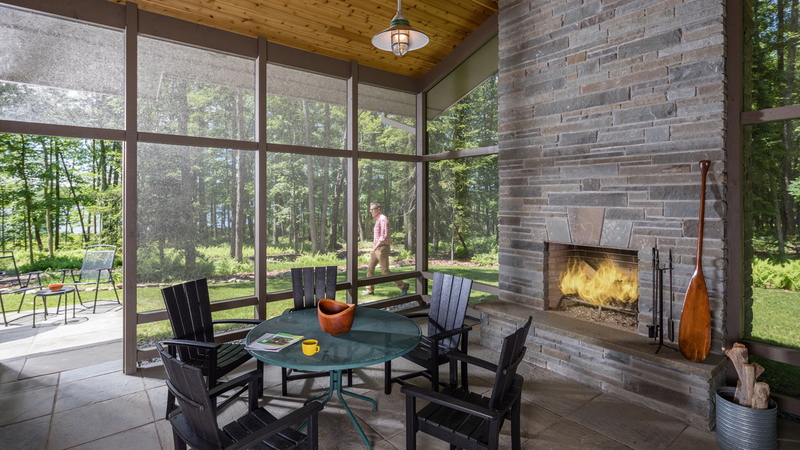 If a wood burning feature is desired, as an alternative, RPA has created outdoor rooms or screen porches with masonry fireplaces or woodstoves to provide the experience of an open fire. Can I open a window in my Passive House? Of course, opening a window in a Passive House is the same as any other home. Opening a window does not dramatically interfere with the temperature, air flow, and moisture levels of a Passive House. Passive House buildings are ten times more airtight than typical new buildings. But this does not mean they feel “stuffy.” A Passive House window opens like any other. 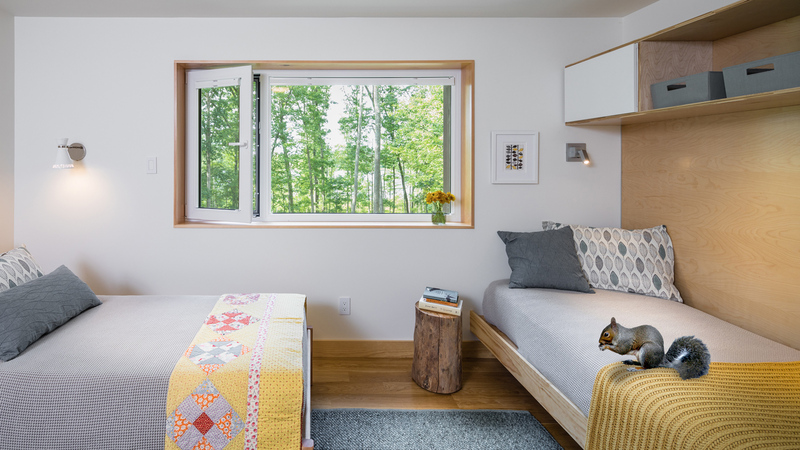 And because the Passive House is better insulated, its residents may choose to leave windows open more days per year than the resident of a home built to historical standards. What if there is power outage? 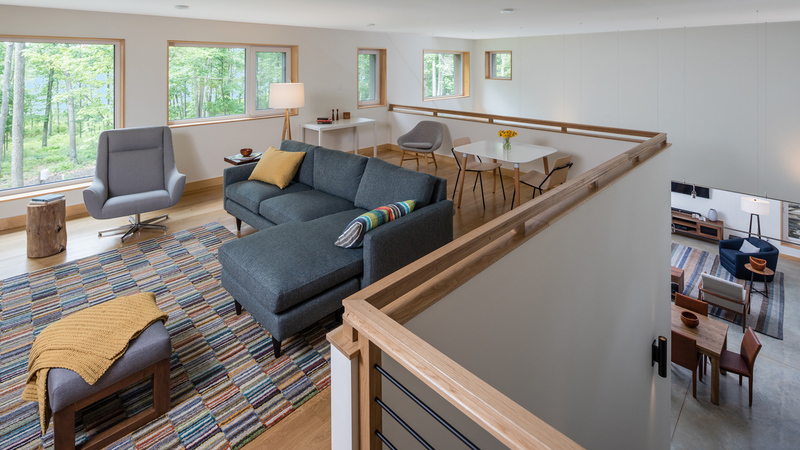 The indoor conditions of a Passive House are much less affected by a power outage than a typical home because a Passive House will keep comfortable and stable indoor conditions without the need for heating and cooling for extended periods. 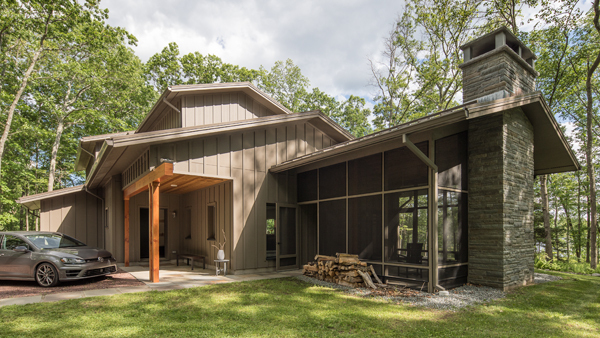 A Passive House is design so that without any heating input, the temperature will not fall below 60 degrees – ever! Why not just use spray foam? There are many better choices for insulation including cellulose and rock wool. Can I use a ground source heat pump? Yes, but it is unnecessary because there is no need for the amount of heat that a ground source heat pump provides. A Passive House requires a very small amount of energy to keep comfortable. A ground source heat pump is also an added expense that is not needed in a Passive House. The Passive House principles were discovered in the energy crises of the 1970’s and a few pioneering projects were constructed in North America using the new ideas centered on superinsulation. Energy prices fell and interested waned for this revolutionary way to construct comfortable and energy efficient buildings. Europe picked up in the 90’s where we left off in the 70’s and has constructed an estimated 30,000 to 50,000 Passive House buildings. 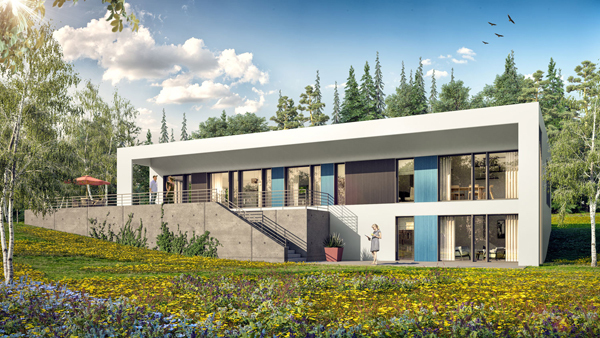 Passive House buildings are becoming the norm in Europe with entire countries such as Belgium requiring ALL new buildings must be designed and constructed to meet the Passive House standard. 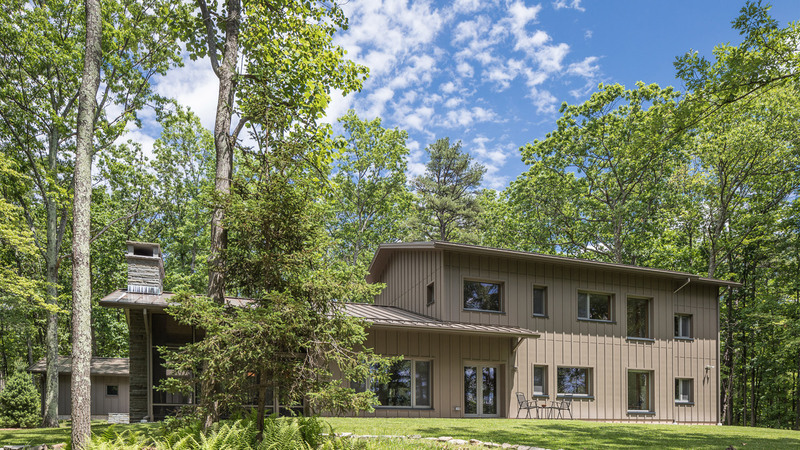 The first Passive House was built in North America in 2003 by Katrin Klingenberg, the executive director of the Passive House Institute US (PHIUS). 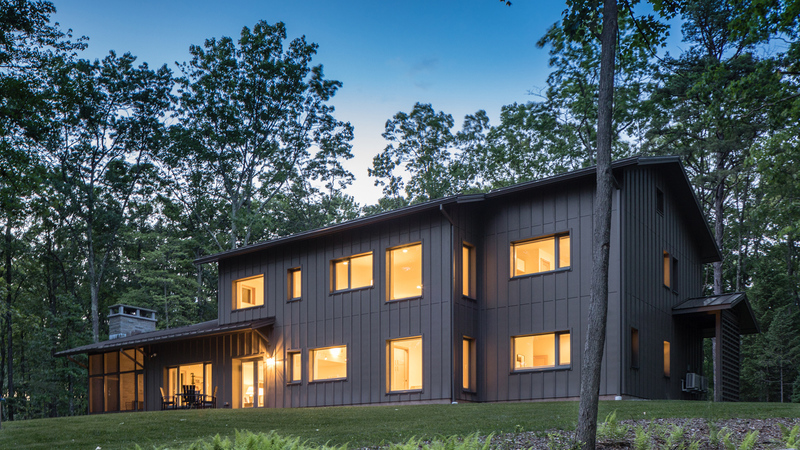 Passive House is now steadily gaining popularity in North America. Can I change temperature between rooms in a Passive House? 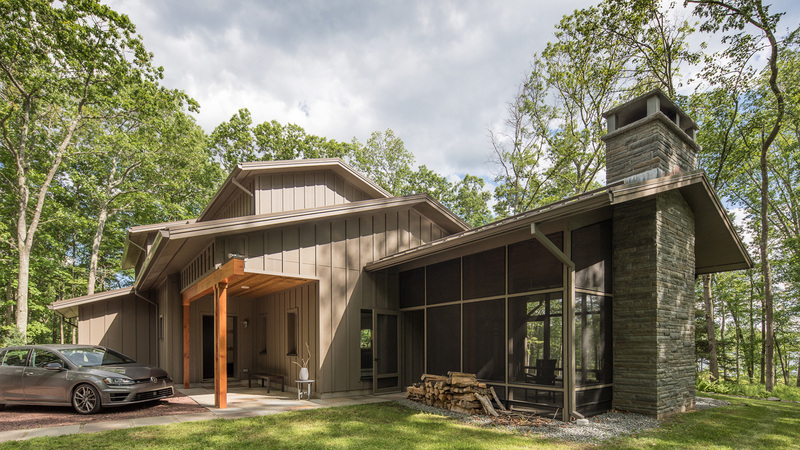 A Passive House is designed to be the same comfortable temperature and humidity in every room throughout the year with minimal input of auxiliary heating and cooling. The interior conditioned volume of air is treated the same throughout the entire building so there is no need to turn a thermostat up or down, in fact there is no thermostat. The fresh air system that circulates air throughout the house typically has three settings, low, standard, and high. Can I use standard clothes washer and dryer in Passive House? Yes, however, a condensing or heat pump dryer is preferred because a conventional dryer exhausts the interior conditioned air to the exterior requiring the use of additional auxiliary heating or cooling energy to recondition the interior air environment. 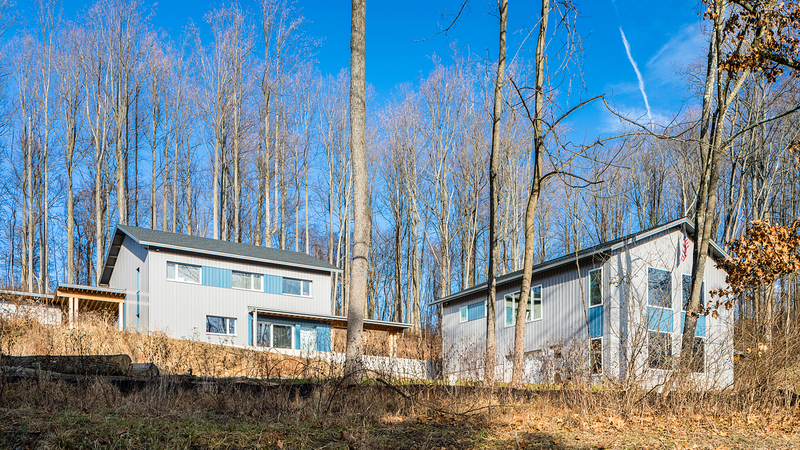 Can a Passive House be combined with other building standards? 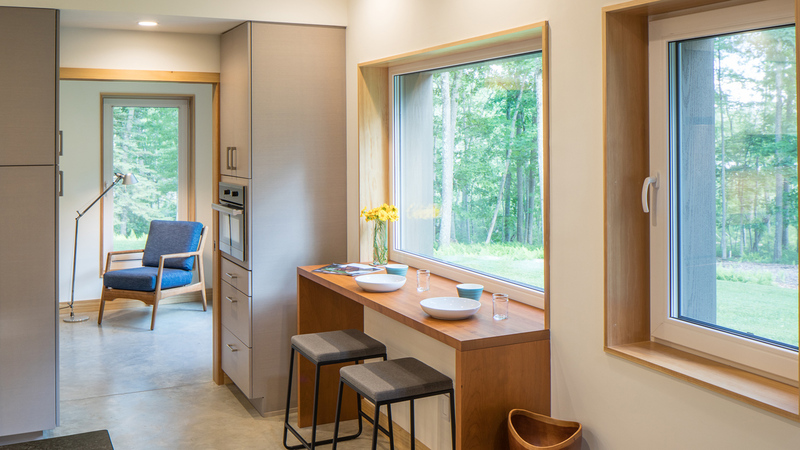 Designing and building to the Passive House standard is focused on reducing energy consumption as a means to create a comfortable, healthy, affordable, and energy efficient home. The Passive House standard can be combined with many other green building standards such as LEED, Living Building Challenge, Energy Star, and Zero Energy Ready Building (ZERB) to further measure water consumption, resource consumption, embodied energy, and recycled content. As a conventionally trained architect, I was taught that architecture is shaped by many factors including location, structure, technology, social patterns, and cultural conditions. Current architectural training does not include building science fundamentals. I had to add that to my education. While the modern architecture revolution that took place in the 20th century provided great aesthetic leaps, it suffered from poor resource management. 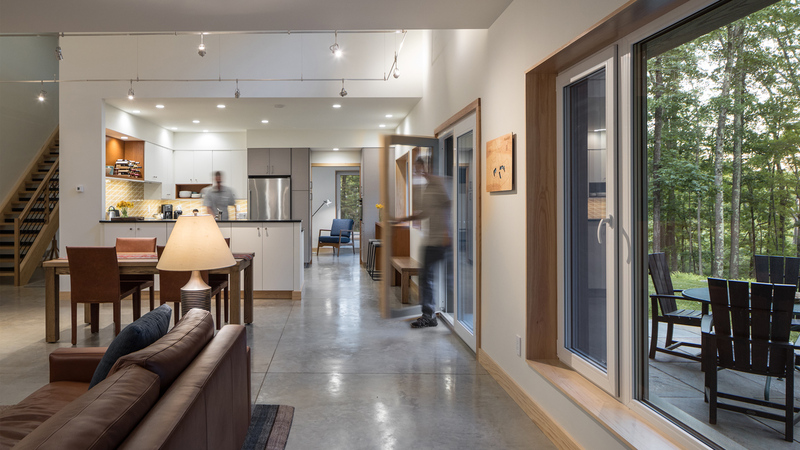 Passive House and building science gives us, for the first time, a path to create inspiring modern buildings that provide occupant comfort and affordability without taxing the environment. Measuring energy and embracing the laws of buildings physics brings new patterns to architectural expression. These patterns include consideration of building orientation, geometrical efficiency as well as thoughtful management of air, moisture, and heat transport through the building. Rather than a limitation or constraint, at RPA, our objective is to see energy conservation as an opportunity for new expression in our built environment. There is no prescribed aesthetic or construction technique for Passive House. It can look like any other building as long it satisfies the requirements for energy consumption and airtightness. 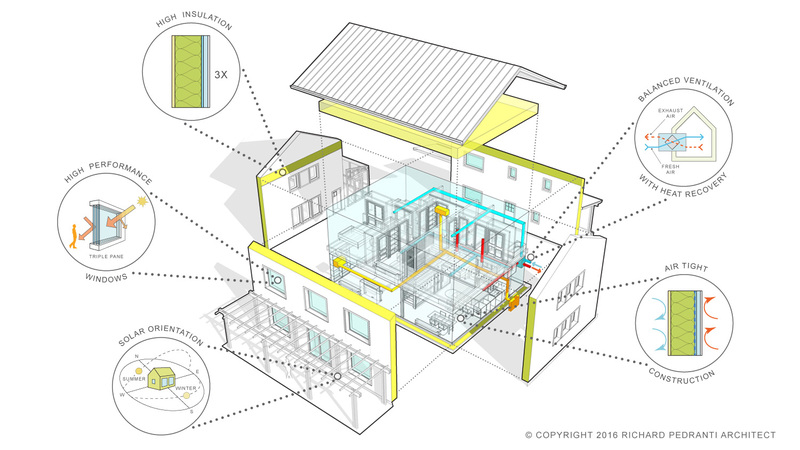 What is different about Passive House? A Passive House is very comfortable with no drafts or cold spots. A Passive House has very healthy indoor air quality. A Passive House has very low energy bills for heating and cooling. An 80% to 90% reduction versus a typical home. A Passive House is simple to maintain and operate. There is no furnace to service and replace. A Passive House is resilient with the ability to weather power failures and extreme weather conditions. A Passive House is durable over time due to the high quality materials and tight construction details. A Passive House is measured and verified during construction to ensure it meets the high performance targets.